This 2 in 1 desktop ionizer and fan from Ion Stream is a desktop essential. Breathe easier by adding negative ions to your work space. 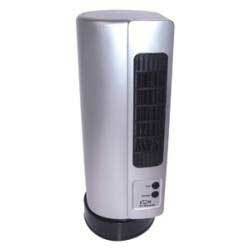 The desktop ionizer and fan combines the cooling advantages of a fan with an air cleaning ionizer. The fan delivers cool air at any angle & includes a gel pack for additional cooling power. Simply refrigerate the gel pack between uses. The built in negative ion generator propels millions of air purifying, odor fighting particles to keep your personal space clean and fresh smelling. Breathe easier by adding negative ions to your work or sleep space. Using their negative electrostatic charge, these ions adhere to odors, dust, pet dander, and other allergens (which are positively charged), weighing them down and causing them to fall, leaving only clean, fresh air to breathe. You get purer air without cleaning any filters! Ion Stream creates an environment heavy in negative ions, like that found at the base of a waterfall or high in the mountains. This clean fresh air helps to improve mood and aid alertness. Fan and ionizer can be operated separately if desired. 14 inches high.